So, you wanna do German? 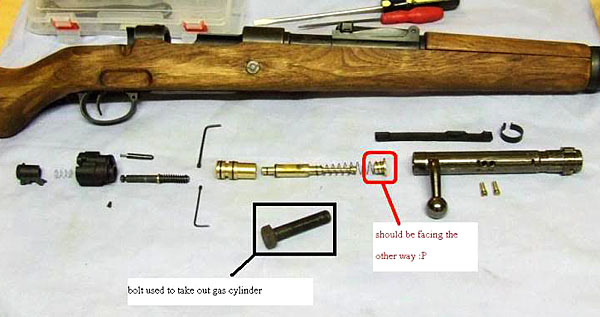 I thought I would put together a K98 Gas bolt take down guide as mine was venting gas out of the safety lever area and there wasn’t a picture guide anywhere on the internet to show the internals. 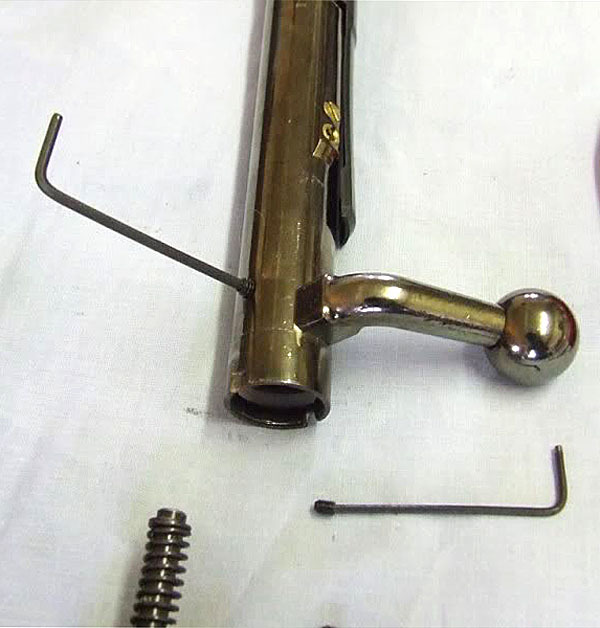 First remove the bolt from the K98. Remove the back of the safety using the small grub screw (no need to take this out but wanted to see what it was like inside). 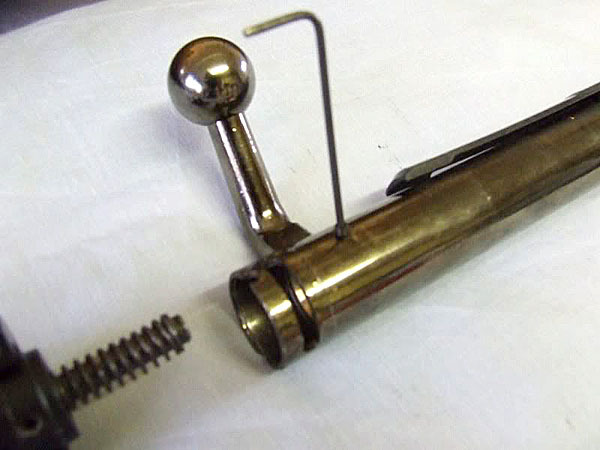 Remove the small screw that holds the whole back piece onto the bolt. 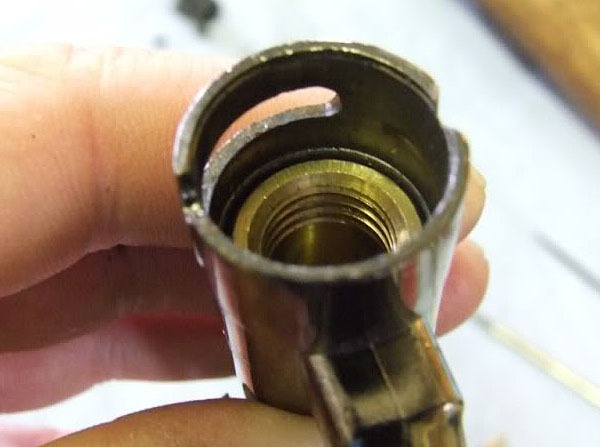 Remove the 2 valves that sit on top of the bolt remembering which hole they screw into. 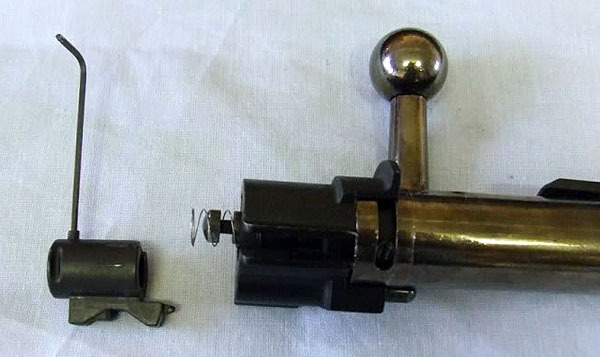 Remove the 2 small grub screws either side of the bolt, these are 2 different sizes so use the appropriate keys. 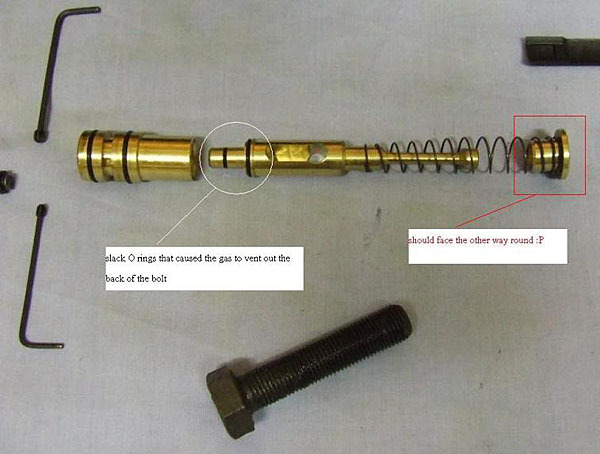 If you look down the end of the bolt you will see the gas chamber as I call it you will also see that its threaded,. 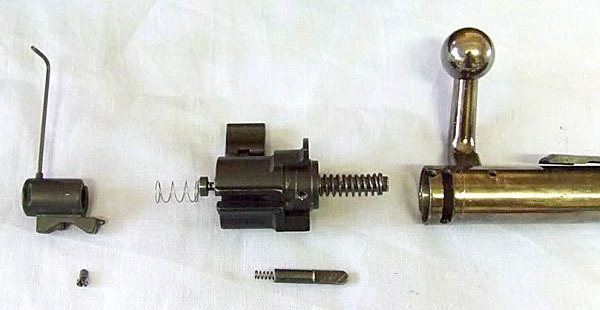 You will need a bolt with the same thread to extract the gas chamber, just screw the bolt in, not too tight, then pull carefully and slowly until the gas chamber has come out. It’s a very tight fit, but once it starts to move it will come out fast! 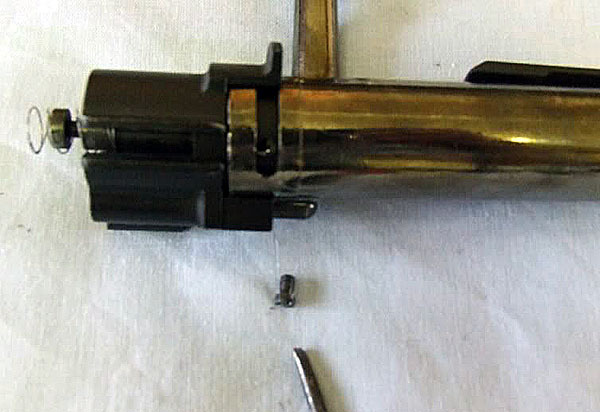 Another picture where you can just see the plunger that the firing pin pushes into. All the parts laid out. 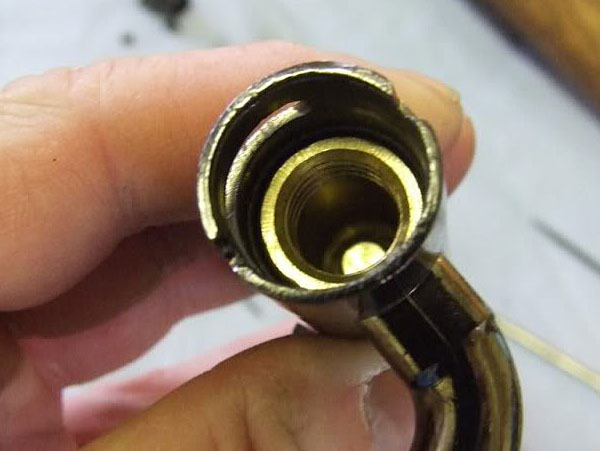 The problem I had was that the rear O rings on the plunger were a bit of a slack fit, I then put them in car brake fluid for 15mins (not too long or it can bugger ’em up). After a 10 secs fill of Abbey predator Ultra gas the bolt on mine managed 25 bolt cycles at room temperature with no leaks at all. The stock was sanded back to bare wood then given one coat of Colron American walnut wood dye and 3 coats of Parker Hale express gun oil. All metal work was rubbed down and Phillips professional cold blue applied. The K98 had its first outing and I’m very very happy with it! Accuracy got better as the hop bedded in, damn crono was playing up so we couldn’t get an accurate reading but we estimated it to be around 480fps to anything around 520fps. I managed to get 6 clipper strips (30 shells) before it needed a refill as well, so not bad overall. I still need to work on a shell catcher of some sort but was great fun to use. 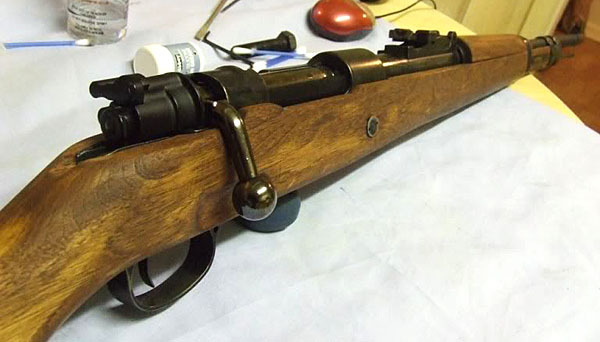 Why not visit the WW2 Airsoft forum? Its a mature and lively place that has information on all the latest events as well as advice on uniforms and weapons and is the hub of the WW2 Airsoft community. Have a ‘lurk’ or register if you want to join in – get involved, its the place to be! Don’t forget to visit the WW2 Airsoft forum. It’s a lively and friendly community forum, again independent, that welcomes new and old players alike. All the upcoming UK games are listed there along with the detail and booking information. Comment, suggestions, offers of articles or reciprocal links are most welcomed – get in touch! Copyright © 2019 WW2 Airsoft - UK All Rights Reserved.